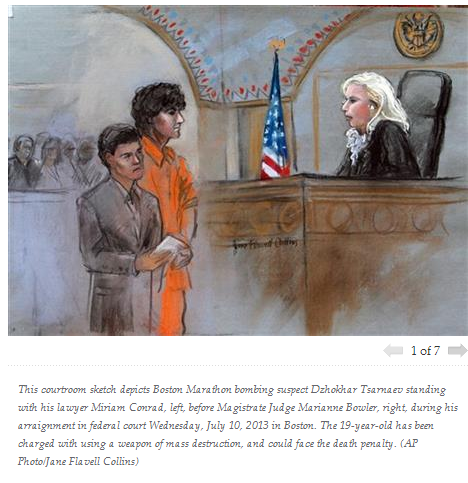 BOSTON MASSACRE BOMBER TERRORIST TSARNAEV PLEADS NOT GUILTY IN COURT……. – The Tundra Tabloids……. 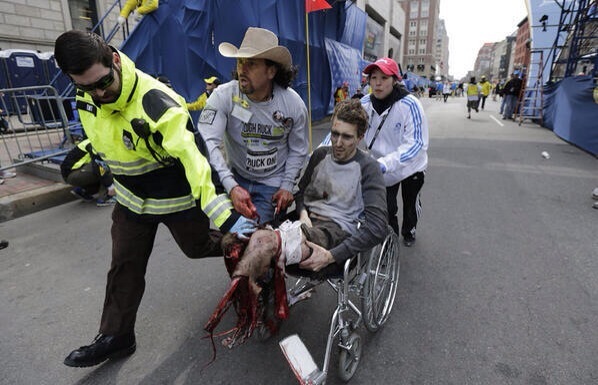 BOSTON (AP) — His arm in a cast and his face swollen, a blase-looking Dzhokhar Tsarnaev pleaded not guilty Wednesday in the Boston Marathon bombing in a seven-minute proceeding that marked his first appearance in public since his capture in mid-April. As survivors of the bombing looked on, Tsarnaev, 19, gave a small, lopsided smile to his two sisters upon arriving in the courtroom. He appeared to have a jaw injury and there was swelling around his left eye and cheek. Leaning into the microphone, he told a federal judge, “Not guilty” in his Russian accent and said it over and over as the charges were read. Then he was led away in handcuffs, making a kissing gesture toward his family with his lips. One of his sisters sobbed loudly, resting her head on a woman seated next to her. Tsarnaev, who has been hospitalized since his capture with wounds suffered in a shootout and getaway attempt, faces 30 federal charges, including using a weapon of mass destruction to kill, in connection with the April 15 attack, which left three people dead and more than 260 wounded. He could get the death penalty if prosecutors choose to pursue it. Next Post Next Post CHRISTIANS RECOUNT STORIES OF KIDNAPPING, TORTURE AND SLAVERY IN MUSLIM SINAI……. Of course he will plead not guilty. In his eyes he has done nothing wrong. He has committed no crime because infidels lives are worthless. The sooner that everyone gets this, the better! Then and only then can we deal with Islam for what it is.